A month after the discovery of the gold treasure by divers off the coast of Caesarea, another report has reached the Israel Antiquities Authority of a find involving a cache of rare coins and silver and bronze objects 2,300 years old, in a cave in northern Israel. Officials in the Israel Antiquities Authority believe this is one of the important discoveries to come to light in the north of the country in recent years, and will require much time to study in order to crack the secrets of the cave. Two weeks ago Reuven Zakai, his son Hen Zakai and their friend Lior Halony, members of the Israeli Caving Club, set out to make preliminary preparations for a visit by the club in one of the largest and well-hidden stalactite caves in the north. The three lowered themselves down in the ground, into the stalactite cave, and wriggled through a narrow passage in front of the cave. They wandered and crawled between the different parts of the cave for several hours. The youngest member of the group, Hen, 21 years old, says he forced his way into one of the narrow niches when he suddenly caught sight of a shining object. 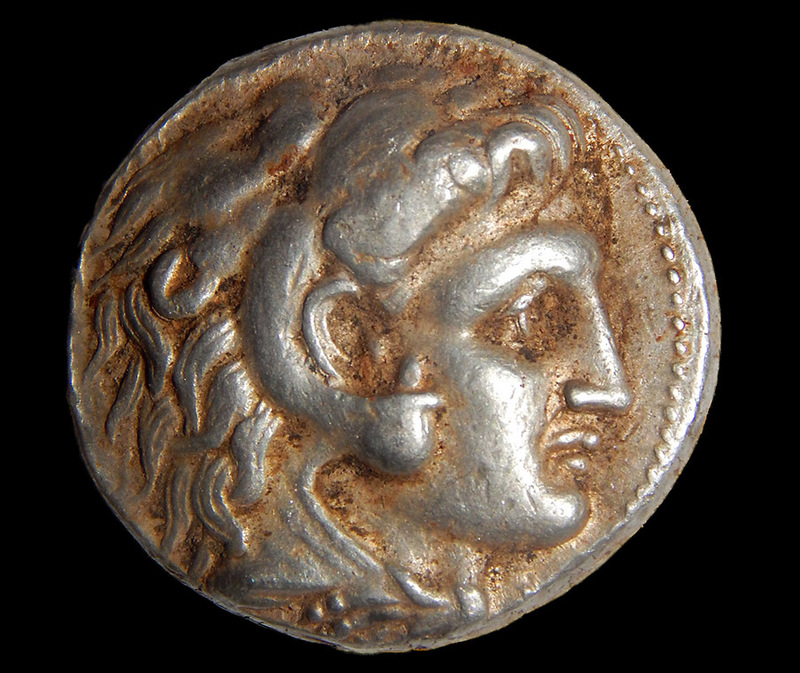 There he discovered two ancient silver coins which it later turned out had been minted during the reign of Alexander the Great who conquered the Land of Israel at the beginning of the Hellenistic period (late fourth century BCE). 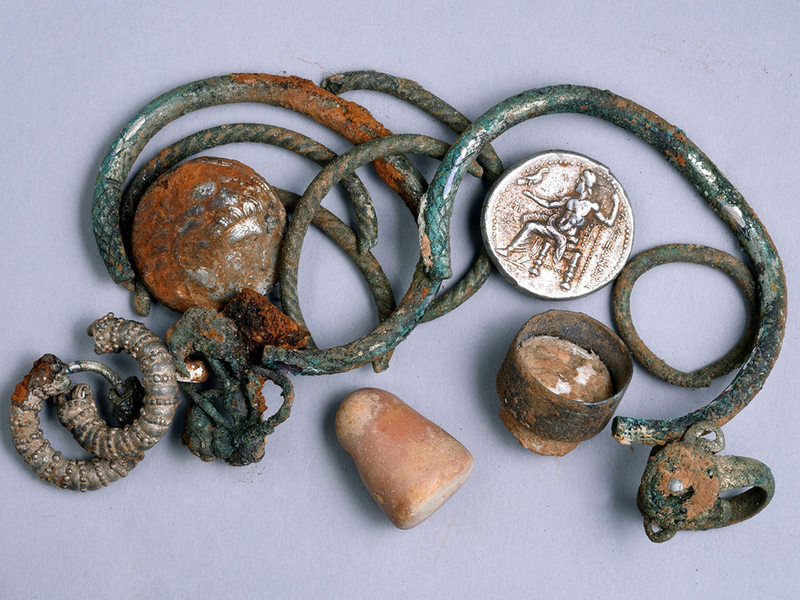 Several pieces of silver jewelry were found alongside the coins, among them rings, bracelets and earrings, which were apparently concealed in the cave, together inside a cloth pouch some 2,300 years ago. In the opinion of archaeologists at the Israel Antiquities Authority, “The valuables might have been hidden in the cave by local residents who fled there during the period of governmental unrest stemming from the death of Alexander, a time when the Wars of the Diadochi broke out in Israel between Alexander’s heirs following his death. Presumably the cache was hidden in the hope of better days, but today we know that whoever buried the treasure never returned to collect it”. The spelunkers realized they found an important archaeological discovery and reported it to inspectors of the Unit for the Prevention of Antiquities Robbery in the Israel Antiquities Authority. This weekend officials of the Israel Antiquities Authority entered the cave together with members of the Israeli Caving Club. The IAA inspectors were excited to discover evidence of human habitation that occurred in the cave over extended periods. At this point they believe they have found artifacts in the cave that first date to the Chalcolithic period c. 6,000 years ago; from the Early Bronze Age c. 5,000 years ago, the Biblical period 3,000 years ago and the Hellenistic period approximately 2,300 years ago. Numerous pottery vessels were also discovered in the cave. In some regions of the cave ancient pottery vessels were found on which stalagmites had developed. Some of the pottery vessels had bonded with the limestone sediments and cannot be separated. The Israel Antiquities Authority reports that the combination of a stalactite cave and archaeological finds is both fascinating and rare. The finds in the cave will allow the researchers – archaeologists and geologists alike – to accurately date both the archaeological finds and the process of stalactite development.